You've heard about our Hewescraft purchase, but what about our other boats. Things were getting a bit crowded around the cabin, so we decided to downsize. Our Campion bowrider was our main means of lake transportation and she served us well for eleven years. On our trip north towing our new boat, we met Dale at the Horseshoe Bay ferry terminal. 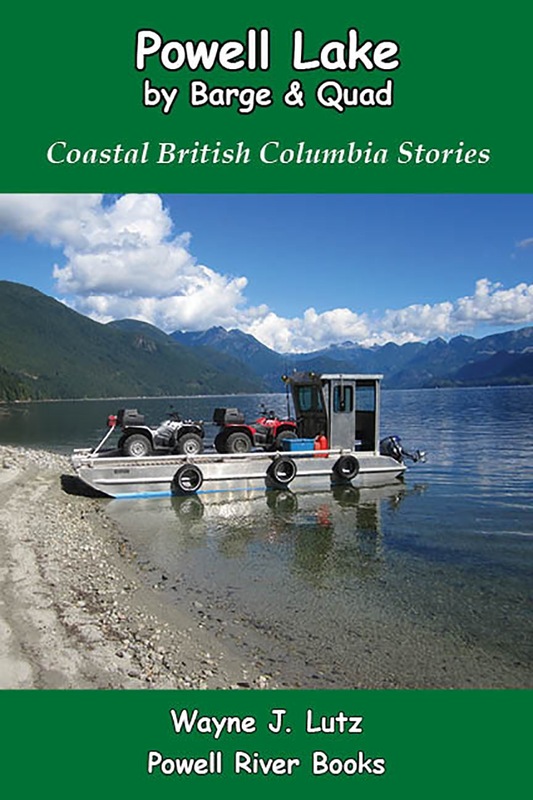 He was in the market for a boat, and it turned out our Campion met his needs. It feels good knowing she is going to a great new home. Our other boat was a Bayliner 2350. She used to be our ocean boat, but moved up the lake for winter use. Our good friend John helped us sell that one too. There's nothing like a new boat. Not just new to us, but brand new. We said we would never purchase a new boat again, you usually get more bang for your buck with a gently used boat. But we fell in love with the Hewescraft Ocean Pro, but none were available locally on the used market. We saw that as a good sign. 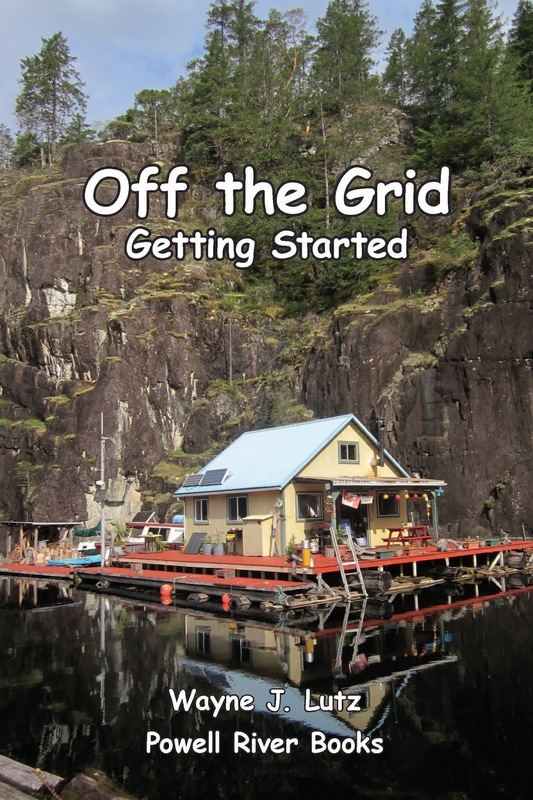 The Hewescraft is fun to use to take lake day trips, but our reasoning was to get a boat that was safer to use in the winter going to and from our float cabin home. Powell Lake is about 51 kilometres (32 miles) long and over 300 metres (1000 feet) deep in places. During storm winds, waves over three feet high can kick up. While we wouldn't try to get up or down the lake in severe conditions, even smaller waves in our old Campion runabout felt uncomfortable. We made a perfect choice! And Stick Tail gives his five claws up "paw of approval" for the new Hewescraft. He usually doesn't like traveling in vehicles, but in the new boat he can sit on the dash and easily see out of the large windows and watch the lake and forest pass by. Last Monday when we headed out of Hole in the Wall to First Narrows, the sky told the whole tale. To the north it was Fall. Looking south, the encroaching storm was chasing Summer away. Wayne and I love to go to Powell River Kings Junior "A" Hockey games. Our hometown team draws players from around Canada and occasionally the United States. It's great hockey and lots of fun joining our neighbours to cheer the players on. GO KINGS GO! For about a year, there's been no concession stand for food during games. But good news, the wait is over. They city has selected Planet Cleve to take over running indoor food sales. The last time Wayne and I were at a game, they were outside with their mobile food cart. Now getting a "best burger on the planet" from Planet Cleve will be even easier. Or choose a pulled pork sandwich, hotdog, or prawns. A recent Facebook post says there will be even more choices inside, including the "best fries on the planet." We'll have to try some of those next time. But it's awfully hard to focus on hockey between bites. She looks, she bites, she scores. Yum! Update: Powell River Kings games are still the best "game" in town, but the food concession is now the Bite Club offering traditional and healthy options. Or at least several claps of thunder. On Monday, up at the cabin, we had one of the heaviest downpours in a long time. The thunderstorm was short lived, but packed quit a punch and gave us about a quarter of an inch of rain in about ten minutes, not to mention the pelting hail. Here's what it sounded like under our tin roof. In the end, Mother Nature graced us with a beautiful rainbow. Just a hint that a nicer afternoon wasn't far away. This week I dug up two barrels worth to store for winter use. First I let the soil in the barrels dry. I find digging the potatoes out with my hand is easiest on me and the potatoes. Eliminating cuts from sharp objects helps the potatoes store better. To help keep my digging hand and nails cleaner, I wear a latex glove. As I dig, I remove the dry dirt to make it easier to find the potatoes all the way at the bottom. I save the soil for use again in next year's potato barrels. For storage, I put the soil in plastic yard bags and let it dry some more. After sealing the bags, I store them in the shed. Using my own seed potatoes and saving my soil greatly reduces the cost of growing potatoes each year. Here's my bounty from just one half 55-gallon barrel. I left them in the sun to dry and to allow the skin to firm up. It's best not to wash potatoes before storage. Just brush off any excess dirt and then inspect them for damage. Damaged spuds should be eaten as soon as possible. They do not store well and may damage your good produce. Always store potatoes away from light and temperatures between 5 and 10 degrees Celsius are best. If they get too cold, the starch will turn to sugar and cause them to be sweet. Paper bags, burlap bags or cardboard boxes are good for potato storage. Do not use a plastic bag. Trapped moisture will accelerate spoilage. Avoid storing potatoes with apples, onions or garlic. They produce a gas that causes potatoes to spoil quickly. If potatoes are exposed to the light they will turn green. Remove any green portions before eating. Potatoes are a member of the Deadly Nightshade family, and the green part is poisonous. Wayne, John, Bro (John's trusty Lab), and I took the new Hewescraft out for a leisurely cruise. We love how it performs. It'll be a fun and safe boat for our frequent lake travel to and from the cabin. This week's day trip was through Goat River into Goat Lake. Goat River can be tricky to navigate in low water, but we raised the outboard and cruised through slowly. Wayne and Bro went up in the bow to watch for submerged rocks, snags, and sand bars. One advantage of low water is that you can see where many (but not all) of the snags are located. 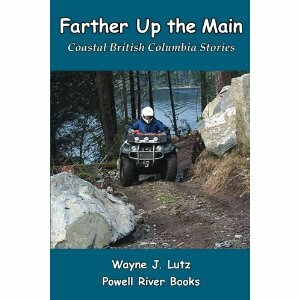 Fortunately, the route is well marked because it's part of the famous Powell River Canoe Route. This week we had an unexpected run of summer weather return. We used it judiciously to head to our favourite beach on Powell Lake. We took the tin boat around to Chippewa Bay and met John, Mike, and Craig for a swim and relaxing afternoon on the sandy shore. 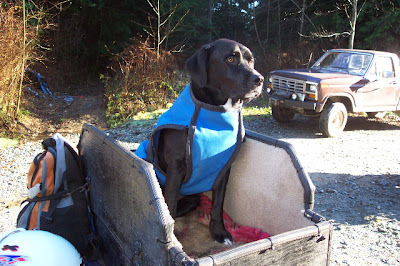 Bro is a famous pooch here in Powell River. 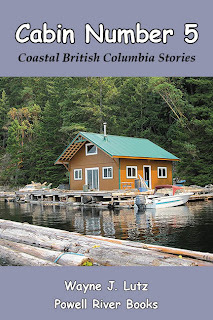 He is one of the main characters in Wayne's Coastal BC Stories books. Bro is getting up in years now, he's about 16. That's senior citizen range for a Black Lab. But Bro keeps on trucking (or I should say quadding). Wherever John goes, so goes Bro in his hand crafted aft quad box. 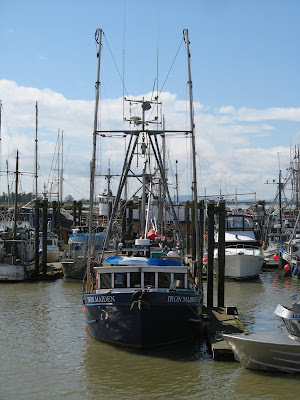 I love visiting the commercial harbour in Steveston, BC with all of its classic work boats. Here's one named the Iron Maiden. When I took the pictures, I was attracted to the classic fishing boat style, and the clean looking blue and white paint job. Then I did a little research online and she became even more interesting. The CFV: Iron Maiden is a fishing boat. CFV stands for a registered Canadian Fishing Vessel. 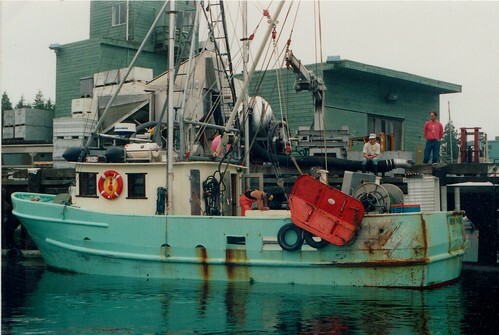 The Iron Maiden is owned and operated by Iron Maiden Seafoods, a third generation commercial fishing family of Sooke, BC. They handle wild, premium grade seafood including tuna, salmon, and shrimp. According to a high school reunion website for GiGi Egan of Iron Maiden Seafoods, they have a second vessel named the Motley Crew. So it appears that the name Iron Maiden is not a reference to the sturdy hull, or middle age torture device. It appears both the Iron Maiden and Motley Crew (Crue) may have names derived from heavy metal bands. It would be interesting if someone from Iron Maiden Seafoods could comment on this for us. After my initial posting, I received a comment from John. He used to work on the Iron Maiden. Hate to tell you this given I was a fan of Iron Maiden Band in the 80s, but I worked on the Iron Maiden which was built in the late 80s by Kurt Robbins a commercial fisherman out of Bamfield. The boat was named after a 60s wrestler. Here's a picture from her early working days. And maybe this is the wrestler. When you live on the water, having a skookum (strong) boat is important. Since 2002, we've used our Campion bowrider to travel to and from our float cabin. She's a fine boat, especially in summer when the passenger can sit up front and enjoy a cool breeze. But in the winter when Powell Lake can get some nasty waves, the Campion isn't really a safe choice. Wayne's been looking for a new boat and we've finally made our choice. We decided on a Hewescraft 2200 Ocean Pro, and the best deal was at Tom-n-Jerrys Boat Center near Anacortes, WA. Lee helped us online, via phone, and in person. He also helped us prepare for the import process at the Canadian border. We left early to make sure there was enough time to clear customs and make our ferry up the Sunshine Coast on time. We were pleasantly surprised that it only took thirty minutes to get the paperwork and GST/PST payments done at Canadian Customs. We even had time to catch an earlier ferry home. Whether I'm looking ahead or checking the rearview mirror, quad riding in the Powell River backcountry is exhilarating -- blue skies, white clouds, green forests, bright pink Fireweed. Storms march across the Pacific Ocean to land on the west coast of North American. A daylight crossing to Hawaii allowed us to see just how this happens. Fortunately, it was a fairly calm day with puffy clearing clouds. Places get named by individuals to honour someone or because of a distinctive feature. Some place names get used often enough for them to become institutionalized, and possibly featured on a map. Here's a place Wayne and I have named to help is navigate up and down Powell Lake to our float cabin home. This large fir has taken a beating during storms. It lost its crown and the remaining lower branches remain in a palm-like array, the trunk leaning precariously out from the cliff. Consequently, we call this landmark Palm Tree Point.